Defra has announced the new Agriculture Bill today (12 September) and NFYFC is pleased to see recognition for new entrants and young farmers in the announcnement, although details of the Bill are yet to be confirmed. 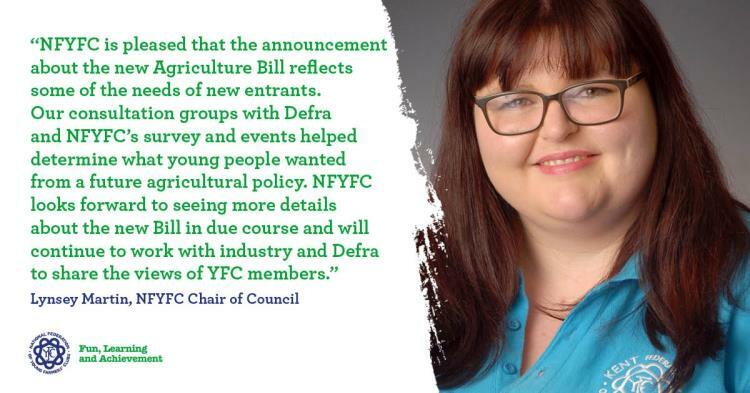 NFYFC's Chair of Council Lynsey Martin said:“NFYFC is pleased that the announcement about the new Agriculture Bill reflects some of the needs of new entrants. Our consultation groups with Defra and NFYFC’s survey and events helped determine what young people wanted from a future agricultural policy. NFYFC held consultation groups with YFC members and Defra across the country in 2017, encouraged young farmers to complete a survey to share their views and hopes for the future of farming post-Brexit and also involved YFC members in discussion groups. All of this research fed into NFYFC's response paper that was submitted to Defra to help shape the plans for a new British Agriculture Bill. NFYFC AGRI produced a position paper from the survey results and submitted a final consultation response in May. What does the new Agriculture Bill include? The Bill will also be underpinned by measures to increase productivity and invest in R&D. To read the full statement on the Defra website, please see here. Keep going and you’ll get there eventually was the advice from the winners of this year’s Young and Senior Stockman of the Year competition, sponsored by Rutland Electric Fencing. Senior Stockman of the Year Henry Knowles from Grayrigg YFC in Cumbria and Young Stockman of the Year Megan Watkins from Craswall YFC in Herefordshire had both reached the national finals before. It was the first time that dairy and sheep farmer Henry had won the title though and he was delighted to be taking it home with him. Cumbria FYFC offers around six stockjudging training events every year with industry experts to help members improve their skills and knowledge. Henry said this has helped top up the daily education he receives working on his family farm. “By entering lots of these competitions, you pick up what the judges are looking for from you. They want to know about the quality of the cuts and which are the most profitable,” he added. For 19-year-old Megan, it was the second time she had won the trophy and the fourth time she had made it to the national final. It’s also a family tradition, as Megan’s two sisters have also been winners in the competition. Megan, who lives on her family farm where they have the Millend flock of pedigree texels and also sell British Blue and Limousin cross heifers with calves at foot, receives a lot of training and support from her father. “My dad has trained me in all classes of stock, starting when I was very young. 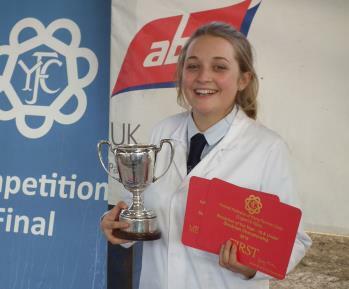 I also revised for both the questionnaire and the meat identification tasks,” said Megan about the preparation she put in for the competition. All competitors had to submit a written project in advance of the weekend and were interviewed on it by the judges. They were also asked to demonstrate animal health and husbandry tasks as set by veterinary surgeons on the day as well as to judge and place beef, dairy and sheep. 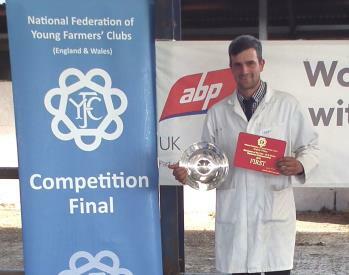 The Stockman of the Year competition was held on 1-2 September at Staffordshire Young Farmers’ County Office for the interviews and vet tasks and then at the Wright Family’s Farm for the stockjudging. The competition was sponsored by Rutland Electric Fencing and supported by Shires Vets and ABP.